Never. If they're headed somewhere and you try to stop them, they will look for another way. They'll climb over, they'll climb under, they'll go around regardless of the effort involved. Their philosophy is to never quit looking for a way to get where you're supposed to go. ALL that it possibly can. Ants don't have quotas or a "good enough" philosophy. They don't gather a certain amount and then head back to the hole to "chill". 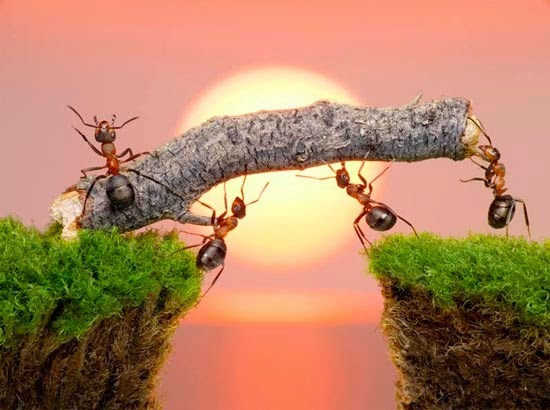 If an ant can do more, it does. Life is about choices, coaching gives people new choices and resources to use. Your past does not have to continue to dictate your future. There is no such thing as failure only feedback; there are no mistakes, only results. Without failure and mistakes, learning would be impossible. The response that you get is your responsibility. If you are not getting the response you want, it is your responsibility to change the approach until you do. People are not broken. They do not need to be fixed. People have all the resources and skills to make any change they want. Coaching makes connections. People make the best decisions given the resources that they have. All external behaviour is the result of an internal process. The mind and body are part of the same system. Every behaviour has a positive intention for the person doing the behaviour, either to seek pleasure or avoid pain. We do not operate directly on our world, but rather through our perceptual map of the world. Success leaves clues. Following those clues provides results.